The Bharatanatyam form seemed to really suit the sisters-duo Neethi Kumar and Preethi Kumar, the prized disciples of proficient Bharatanatyam guru Poornima Ashok of Nrithyanjali and daughters of learned Justice N. Kumar. With relaxed bodies and graceful fluency, it was all about their perfect technique and expressions. The plies or the aramandi of Bharatanatyam were etched precisely. 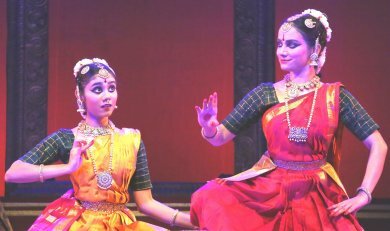 Their duet held at ADA Rangamandira, Bangalore, on the second day of the 28th annual festival of classical dances hosted by Nrithyanjali was rewarding. Guru Poornima Ashok deserves to be commended for her conceptualization and execution of a remarkable repertoire for the "Dvaya" (duet) recital. It drew attention for its unusual range. The wonderful compositions ranged from traditional to contemporary. Thus the compositions by Adi Shankaracharya, Purandaradasa, Meera, Thyagaraja, Annamacharya and the contemporary composer, our own outstanding vocalist D.S. Srivatsa formed the distinctive content of the duet. Undoubtedly, Preethi and Neethi rose to the occasion and unleashed their talents to the best satisfaction of their guru and the connoisseurs at large. The duet began with Surya namaskaram based on a composition by Srivatsa. The sisters covered the stage in interesting geometrical patterns and stole the show. It was a refined dramatization and mini dance feature when they rounded off Thyagaraja's touching krithi Nannu palimpa (Mohana) with well-planned nrithya, nritta and abhinaya a la a varnam. Their synchronized movements and concentration made the presentation a memorable one. The portrayal of Gajendramoksha, shabari moksha, Seetha swayamvaram etc, and the elaboration of the line Vanaja nayana and the divergent kaala, nadai and gati bedha oriented nritta accounted for the dance spectacle. Lithe dancing and enthusiastic partnering enriched Adi Shankaracharya's Ardhanareeshwara stotram and the juxtaposing of the dance with architecture and space. In the depiction of the comparative and contrasting forms, beauty, traits and features of Lord Shiva and Parvathy, their smiles got bigger and more relaxed. In their solo turns too, both Neethi and Preethi came out in flying colours. Neethi's abhinaya of Purandaradasa's Chikkavane ivanu had a series of expressive evocations of Krishna's childhood, one involving an effortless transformation from a naughty little boy stealing butter to the milkmaid who chides him. Annamacharya's Shankarabharana krithi became a visual delight. Preethi was an involved self in the enactment of a Meera bhajan (Jhoolathi Radha, Bagesri raga). The usual tillana was replaced by tani avartana. The sisters gave a neat display of rhythmic skills by translating the laya patterns into eloquent display of footwork. The musical ensemble led by guru Poornima Ashok (nattuvangam) and D.S. Srivatsa (vocal) was exemplary. There was a quality in G. Sunidhi's gaze, thrown to a dramatic distance but waiting at a realistic proximity, that often created an illusion of engaging in a one-to-one communication with the audience. Her Bharatanatyam recital was at ADA Rangamandira under the aegis of Nrithya Kuteera led by young and enterprising guru Deepa Bhat. The usual repertoire however had lot of those moments in choreography that sets apart a dancer. The mark of an artiste steeped in her art form, a certain effortless fluidity that masks the many complex ideas blending in performance, was apparent in Sunidhi's dancing. It was clear that under the able guidance of Deepa Bhat, she has acquired the confidence to break free and the artiste you see today is a dancer who is relaxed, uninhibited and happy to be performing as one saw in the perfect finishes of the kitatharikitathom adavus. She could extend this effort to all the dhi dhi tai adavus as well. More energy in the nritta was also conspicuous. The high quality performance by Sunidhi began traditionally. The sankeerna jaathi and Charukesi raga alarippu created the required ambience and warming up. There were beautiful thoughts which were choreographed with energy and sensitivity by Deepa. In the shabdam addressed to Lord Shiva, the hold over nritta was further proved. The piece de resistance, the Anandabhairavi varnam (Ponnaiah Pillai, Sakhiye inda velaiyil on Lord Rajagopala, the presiding deity of Mannargudi) was certainly a testimonial to the dancer's craft, what with the demanding nritta and the mature and understated abhinaya. A Bhavageethe (Patigalu aivaru, meaning five husbands, Simhendramadyama raga) by Dr. H.S. Venkateshamurthy explaining the miseries of Draupadi whose five husbands were helpless in rescuing her from Dushasana and Lord Krishna becomes the savior was a rare choice, that portrayed delicate emotions. In the following Devi stuti and Pogabedavo Ranga, Sunidhi's abhinaya talents were evident. Deepa Bhat (nattuvangam), Karthik Hebbar (vocal) and others lent inspiring music support. Dr. M. Surya Prasad is a tri-lingual music and dance critic of Karnataka, scholar, organizer, educationist, researcher and translator.